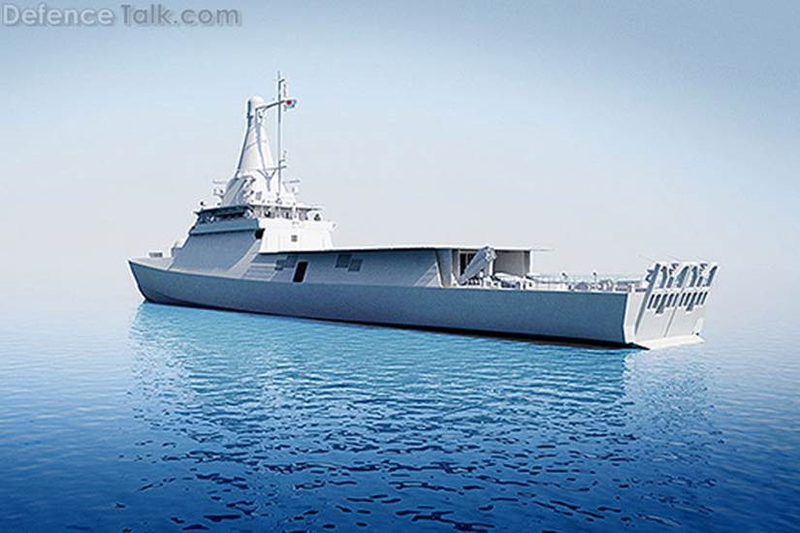 Singapore is building a new class of patrol vessels that look very much like my proposal for “Cutter X”, trading some Webber class and some larger ships for an intermediate design, costing about half what an OPC would cost, basically putting the equipment and crew (with some augmentation) of a Webber Class into a larger more seaworthy hull, to allow them to be used for extended operation in environments that do not require the ice strengthened hull and ability to launch and recover helicopters and boats in sea state five provided by the OPC. In some respects these ships are more capable than the proposed cutter, in that they will have a 76mm gun and firecontrol system, in addition to smaller remotely operated weapons. It also appears to have space reserved for a small AAW missile system. On the other hand, while the flight deck can handle an H-60, the ship, unlike the French L’Adroit which was my model for “cutter X”, has no helicopter hangar, although it might be possible to add one using the same solution employed on L’Adroit (putting it under the bridge). Soon, I expect to do an update of the “Cutter X” proposal, based on where we are now in the cutter recapitalization program. This entry was posted in Budget, International, News, Shipbuilding, Ships, Weapons and tagged FRC, OPC, Singapore by Chuck Hill. Bookmark the permalink. 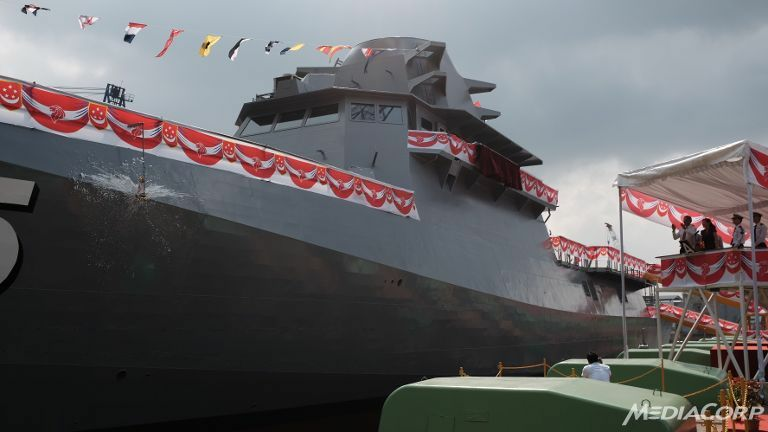 It looks like what Singapore is building is a cross between a Sentinel-class cutter and a L’Adroit. It looks like what they did was combined the features of the Sentinel-class cutter and a L’Adroit. It would be interesting to see what it looks like when built and put on the water. But cutters are large in many cases because they must operate at great distance from their bases. I am aware of your service’s illustrious war record. But surely the USCG’s job is to support the USN in that it is an extra capability therefore ASW shouldn’t be a main driver for large cutter design perhaps beyond a good flight deck and perhaps hull mounted surveillance set to help in a screen. What I am sating is that the US’s ASW gap is a USN failing you Coasties have enough work to do without worrying about other’s work. Still as I said above if anybody can afford to gold plate a unit it is the US. But if this ASW business is a real concern beyond border protection then I don’t see how you can cut the down modest size of the NSC class. I haven’t really seen that the NSCs were built with the intention of giving them an ASW capability, though I think it would certainly be possible, but the things that drove the size (perhaps bit more than the minimum) were expectation of months long deployments to Alaska and the western Pacific for fisheries, and off Pacific coast of Colombia and Central America for drug enforcement. I think in a perfect world two classes of OPC’s would be a good idea. Very difficult to do politically and in the context of a small and decreasing procurement budget unfortunately. The USCG needs to build two OPC’s a year at full production, and it is going to take singular focus to make that happen. Trying to gather support for an OPC lite would further complicate the issue on the Hill. The high end OPC’s that can work in the Arctic are a critically needed asset, and one specifically delegated to the USCG, not the USN. My opinion would be get the first batch of 11 or 12 built to as high a spec as possible with a two a year build rate. Then look at other options such as a decontented OPC or a Cutter X.
IMO the Navy has assets that can fill some Cutter X type roles in the Gulf. The JHSV being one of them. There is nothing in the Navy comparable to the proposed OPC or the NSC that is optimzed for long endurance, operationally idependent, low intensity, light footprint missions. The USCG has to have the OPC in reasonable numbers. I do agree that a Cutter X could perform the SAR and policing role in the Gulf about as well as an OPC at half the cost. Just don’t know if it is politically possible to do it without putting the OPC program at risk. There is also the possibility that having two ongoing shipbuilding programs would double the number of delegations interested in funding Coast Guard ship building. We have seen Congress increase funding over the administration requests to keep FRCs being built at near the maximum rate at Bollinger. That model has worked for the LCS too, (from a political budget procurement standpoint). Despite all the detractors in congress, having the delegations of both Missippi and Wisconsin in full support of the program has helped it on the Hill. If you had the delegations of both Louisiana and Florida or Maine lobbying for the OPC program that could help funding. If the USCG wants to do that, then the time to make that decision is pretty quick. Any of the 3 finalists could be downscaled and downspeced. So you could award one contract to a higher spec and another to a lower spec. I don’t think that is what the USCG is going to do, but when I think about it that way it might not be the worst idea in the world operationally, and might be very smart politically. There is significant risk in trying to manage two OPC programs at the same time though. The Coast Guard is already engaged in two ship building programs, The NSC and the FRC. Basically I see the OPC assuming the position of the NSC and the X class assuming the position of the FRC in the budget process. At a build rate of 4 a year, the USCG is never going to be done building FRC’s given their 20 year expected service life. By the time the class is built out at 58 it will be 2027 (assuming Bolinger gets the whole enchilada and there isn’t a break in production), and the Sentinel will be just a few years from decommissioning, so it will be time to start developing the next FRC. JamesWF, Cutter X would replace some Webber Class and some OPCs so we would not be building 58 Webber class. The Webber was commissioned in 2012 so by the most optimistic estimate (start replacing after only 20 years), the first replacement would come out in 2032 (probably funded in 2029). Currently the administration is only asking for two Webber class, but the Congress has been funding six a year. I do see an imminent need to build replacements for the 87 footers since these 73 boats were commissioned over an eleven year period from 1998 to 2009, but they should have less budgetary impact than the Webber class. Should have said Alabama not Mississippi. I get that they have been funding 6 a year, but it’s been a pretty steady 4 FRC’s a year being delivered, one each quarter. If they build out all 58 at that pace it would be 2027, if you figure a few years to design and develop a replacement, then a few years to ramp up production, then the timing is just about right. I understand your point that they will hold onto them for longer than 20 years, which of course they will. But those cutters are going to be used heavily, and it will become increasingly expensive to maintain them after 20 years, which will just put the CG in the same position they are in now, with an overworked, old, expensive to maintain fleet. I really like the idea of constantly having a FRC type vessel always in production or under development because I think it makes procurement more efficient. If a cutter line is running hot and on budget, then I’m loathe to cut it short for a new program. The caveat is if the USCG can’t fund two OPCs, and four FRC’s a year. If they can’t find a way to do that, then they need to look at altering the mix along the lines you are talking about. But remember, that is going to make the cost of the OPC’s and FRC’s go up, so the hypothetical mix may wind up being more expensive than the planned mix. I think it adds risk to add a 4th cutter to the current 3 high end cutter mix, and would prefer that they just remove the icebelt from a certain number of OPC’s to help make budget. The question is can the CG afford to build a minimum of 4 FRC’s and 2 OPC’s a year for the better part of a decade? If they can’t, then the current model won’t work. There are 30 Webber class already funded and there are two in the budget request for FY2015. If the Congress does not come through with funding for six as they have in the past and they continue at a rate of four per year in subsequent years, the remaining 26 vessels would require seven years meaning the last would be funded in FY2022. I think they may actually be funded sooner if the Congress continues to do what that have done. If they provide for six in FY2015, the remaining 22 would only require four years if six are funded each year meaning that the last of 58 would be funded in FY2019. Would a ship between 1000 and 2000 tons self deploy? I know smaller than that no, and bigger than that yes, but don’t know in the Cutter X size range. Yes, they could self deploy. They would have the range and decent cruise speed. During WWII flat bottomed landing craft no bigger than the Webber class self deployed (LCIs, many CG manned). Now we have the advantage of much better weather forecasting. These ships are actually the size of the smaller destroyers or destroyer escorts of WWII, and probably even more seaworthy. The OPVs built in Britain for Trinidad and Tobago that I tried to get the CG to look at self deployed to Brazil after that country bought them. L’Adroit has been sailing unaccompanied all over the world. 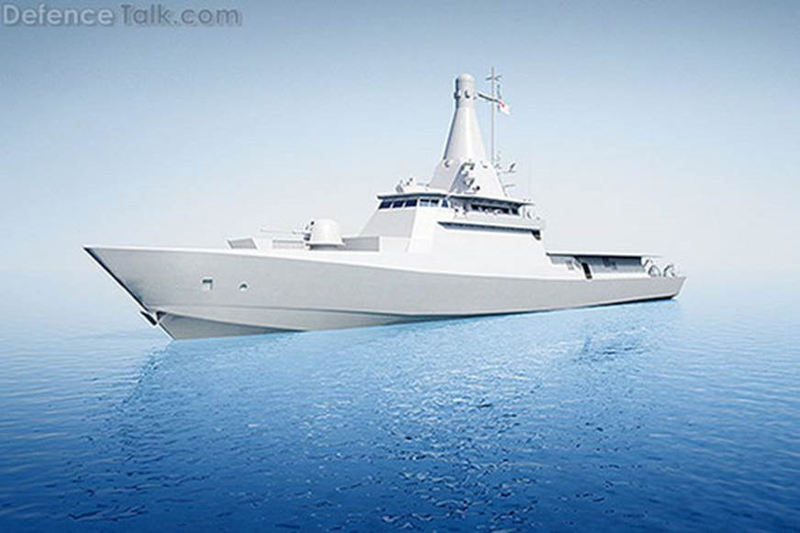 Not that it matters, but I will say no one builds prettier to look at ships than DCNS. Layette, FREMM, and L’Adroit all look great. The L’Adroit is strikingly long and austere looking. I guess I don’t know enough to really have an opinion on whether reducing the buy of FRC’s and OPCs in order to buy some OPC lites.would be a good move operationally. It’s complicated and would require lots of knowledge of mission requirements and operational tempo. I suspect it is something that reasonable people could disagree on. Chuck’s idea seems to make quite a bit of sense, I’m just not sure if it would be a good idea politically for the USCG to further complicate the OPC procurement funding process on the Hill. On Leesea’s point that the USN Navy could use a L’Adroit class ship, I agree. But I would rather have it be a USCG ship that could be forward deployed when needed. One reason is I don’t think the Navy would be able to resist adding content, which would push up the cost, and defeat the whole purpose of the ship class. Another reason is I think the CG needs the hulls more for day to day operations, and they would form a good maritime security reserve force for future deployment contingencies. It will be interesting to see what the Navy does when it is time to retire the Cyclones. I know in theory that the LCS are supposed to fill that role. Not sure it will play out that way though. In a lot of ways, I see L’Adroit as an improved 210. I think you can see it in the lines, just made it a bit longer to make it more seaworthy. I think Lee was referring to the Navy buying ships for the Coast Guard (with perhaps some additional vessels going to the Navy), and that he was looking at the armament on the Malaysian ship when he wrote that. In the past the Navy funded USCGC Healey, some 110s, and four of the 87 footers. To stay with the Cutter X concept we would arm with a gun mount no larger or more complex than a Mk38 mod2 (perhaps up gunned to 30 to 40mm), but that does not mean they might not have space and weight reservation for a medium caliber gun, missiles, and a sonar. But if the Navy wanted to fund the purchase we could probably live with a few more medium caliber guns.